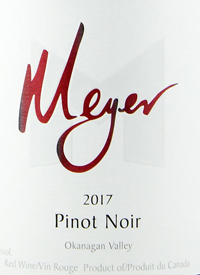 Okanagan Falls, Okanagan Valley, British Columbia, CanadaJust released, the Meyer Pinot is made to drink while you wait for the richer, more complex family members. In 2017 the attack is juicy, the fruit fresh and red with bits of raspberry, pomegranate, and cherries with fine minerality and floral undertones. The textures are silky, which helps to cover up a short-ish finish. The fruit is sourced from the McLean Creek Road Vineyard (Okanagan Falls), Anarchist Vineyard (Oliver), Teasdale Vineyard (East Kelowna) as well as Naramata. Post maceration it spends ten months in older French oak. Duck pizza anyone?Tasted: 03 December 2018Tasted by: Anthony GismondiTreve Ring Prices: BC	26.00	winery direct Producer: Meyer Family VineyardsDistributors: International Cellars Inc.
Okanagan Falls, Okanagan Valley, British Columbia, CanadaJust released. Juicy red currant fruit, sweet ripe raspberry jam, lovely salty note and bright florality, with a brisk rinse of pink peppercorn and spice. This is sourced from the McLean Creek Road Vineyard in OK Falls, and Anarchist Vineyard in Oliver, along with fruit from Naramata Bench, and East Kelowna's Teasdale Vineyard. After maceration, this was gently pressed and then spent ten months in older French oak. Lovely sapid squeeze on the grippy finish. For current consumption.Tasted: 30 August 2018Tasted by: Anthony GismondiTreve Ring Prices: BC	26.00	winery direct Producer: Meyer Family VineyardsDistributors: International Cellars Inc.